With engagement comes celebration, and I'm not talking about the wedding! Whether you're the bride, a bridesmaid, mother of the bride, mother of the groom, or any other involved party, chances are you'll be responsible for one of the many bridal party's to be had. When you're lucky enough to have the greatest group of bridesmaids ever.....The party is never dull (or under-decorated). 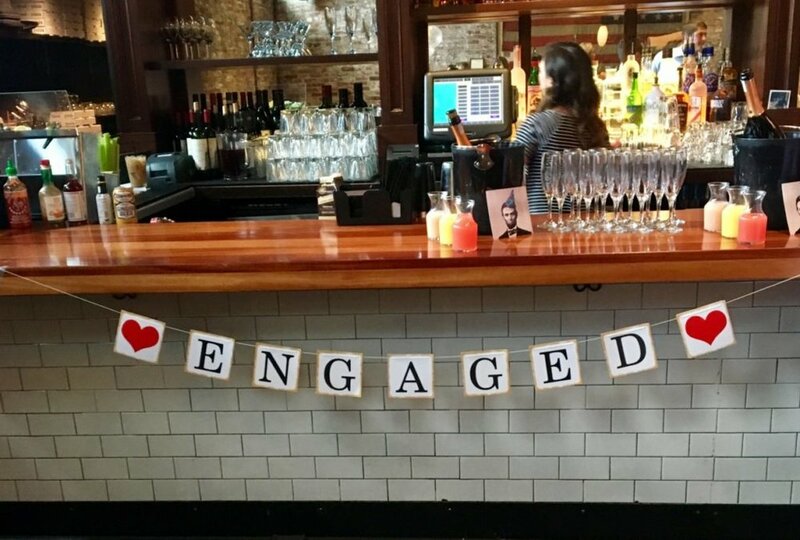 I was so impressed, and touched by the effort and heart my friends put into this engagement party. Every detail was personal, and made the party better than I could have imagined. In efforts of keeping your wallet heavy and your creativity sparked, here are some more simple and elegant ideas for the hopeful DIY-er in all of us.. Create beautiful centerpieces without the high cost of flowers, IKEA and Michaels have a great selection of Artificial Flowers that can make any table look classic and beautiful, or modern and edgy! Welcome your guests with a cute saying written on a Chalkboard Easel ..This is a fun and creative way to decorate your party. Using String Lights to either line the walls, intertwine in the flowers, or even inside a mason jar adds an elegant touch to your décor- any way they're used.. they are always a hit. Mason jar.. ANYTHING. This is my favorite DIY tool of all time. You can really do anything with them. Mason jars can be used as a vase for flowers, floating tea lights, candles, lights, or can even be decorated on the outside. Frame pictures of the bride and groom, the date of the wedding, or use the frames to house inspirational love quotes or sayings for the husband and wife to be. The best part about all of these decorations.. They are all under $10! You can make such a beautiful, and personal celebration without emptying your wallet. Take a leap of faith and see where your creative mind can take you.